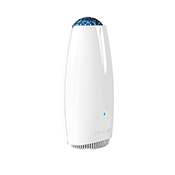 AirFree air sterilizers are totally silent and kill 99.99% of all airborne micro-organisms such as dust mites, bacteria and mold spores using a patented sterilizer technology. Not only is the AirFree air purifier energy efficient, using the same wattage as a small light bulb, but it requires no maintenance or replacement filters which is an enormous cost savings over the usual filter replacement costs. AirFree air sterilizers & air purifiers are available in different models with different features and coverage. We recommend the Onix 30000 since it covers the largest area and sterilizer technology is slower than an air purifier, which using a fan. We particularly admire the manufacturer of Airfree since they back up all of their claims with documented research. We like to recommend Airfree particularly in basements or in small rooms such as an office or baby nursery because it is very effective at removing airborne viruses and other pathogens. 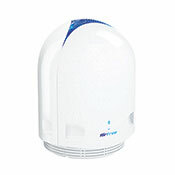 Airfree is the only air purifier manufacturer that is not based around a HEPA or HEPA like filter. In fact, their models have no filters at all, relying instead on a unique patented technology for the sterilization and incineration of allergens. Thus there is no maintenance costs associated with any Airfree model, and we have had excellent experience with their reliability. Since Airfree purifiers rely on natural air flow in a room because they do not have a fan, we see a single unit as better for a small room. They are also a manufacturer that backs up their claims with serious verifiable research. However, we would not recommend them for serious gas and odor removal and you will not find that household dust is reduced - but your allergies will subside. 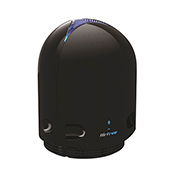 We strongly recommend the AirFree Sterilizer primarily for mold and dust mite control, viruses and bacteria. Efficient: For contaminated air passing through AirFree it’s sterilizing efficiency is 99.99% in destroying microorganisms. Remember as in all purifiers, the allergens have to REACH the machine. However, assuming they reach the machine, the purifying effect is greater than regular HEPA filters. Effective: AirFree destroys even the smallest of airborne microorganisms in its unique ceramic heating chamber without any ozone being used. In addition, it destroys the smallest of microorganisms. For instance viruses are killed at 150°F, and since they are smaller than 1 micrometer, AirFree perform better than most average HEPA filters. AirFree destroys airborne allergens such as all types of fungus, including those from dust mite feces, mold spores, proteins from cat dander. To re-emphasize a point, AirFree does not incinerate dust mites. Air free destroys the fungus dust mites need for food without producing harmful by-products or gasses such as found in ozone machines. Technology: The core of the AirFree is 400°F. It is the intensity of the internal heat that sets AirFree apart and which is the secret of the documented results it has achieved. Room Allergen Reduction: AirFree has achieved 85% reduction in the ambient air, the figure which is what really counts, and not at AirFree air outlet (99.99%). This is a very impressive figure. These results were achieved primarily with mold spores. Remember in certain circumstances, when some other allergens may be blowing into the room at a rapid rate, the results may not be so high. Independently Tested: The AirFree sterilizer technology has been tested in hotels, libraries, banks as well as laboratories and research centers with published results. Note the testing has been principally for mold spore reduction, and for which it has been found to be remarkably effective. User Friendly: You can turn on this air sterilizer and forget it! There is only 1 speed, so you can set it on and safely leave it on for weeks. Silent: The AirFree is completely silent, but it still gets the job done. Great for the office or those bothered by noise in the bedroom at night. Lightweight: At 4 pounds, the AirFree air sterilizer is extremely lightweight, and easy to move or carry. Maintenance Free: One of the most appealing aspects of the Airfree air sterilizer is that it has no filters and requires no maintenance. A true economic advantage over traditional air purifiers which often require replacement filters. Warranty: 2 years. However, with no moving parts, fans or knobs, the estimate lifespan of an AirFree sterilizer is much more than 2 years. This makes the AirFree an incredibly good value for the money. No Fan: AirFree works best in areas where air is already circulating. 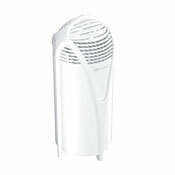 Great for air-conditioned areas, forced hot air or areas with a fan, air purifier, or people moving the air about. Waiting Period: Best results are achieved over a continuous period of 21-30 days of use. Of course you will achieve some effects in several hours, but it may take as much as a month to achieve maximum results. We think the wait is worth it to kill and keep mold spores, bacteria and viruses at a minimum, but if you need to decontaminate a room FAST, this technology would then be best used in conjunction with a room fan. Doesn't Handle Certain Allergens Or Gases/Odors: Not effective for non-living organic particulate matter such as pet hair or gases. The AirFree would not be used for fast odor control where carbon adsorption is needed. Area Covered: Only good for small rooms, although the manufacturer now claims it does a larger area. Just remember that it will just take longer to achieve the desired effect. We recommend purchasing several units to accommodate larger areas in need of air sterilization. Safety: AirFree units reach 144°F on the top lid which is very hot to the touch, but not hot enough to cause a burn. Children will instinctively remove their hands when touching the top lid. We personally liked it as a hand warmer. But some mothers of young children should exercise extra precautions. AirFree can be put on a tabletop, but are best placed on the floor. Why? Because AirFree works by air convection. It will be impossible to grab by air convection the heavier microorganisms that will naturally be deposited on the floor. However, in a laboratory setting, AirFree is placed on table tops because that is where you need the air to be clean and not so much on the floor level. Nevertheless, the lab tests done with AirFree on tabletops had air conditioning which was helpful to the AirFree performance. There is no real evidence that AirFree will not work on tabletops, but the manufacturer recommends it be placed on the floor. AirFree air sterilizers are truly a breakthrough in home air purification with a small footprint at an affordable price! The fact that these air cleaners actually incinerate microorganisms and other contaminants set them apart from other types of air purifiers. If you want to destroy mold spores, fungi, bacteria and viruses, the Airfree air sterilizers are truly in a class of their own, and we’re excited to make them available to you.